The 1998 Steeda Mustang offered by Steeda Autosports came in three packages: Mustang, Mamba, and Cobra. The first level Mustang offered suspension, exhaust, and naturally aspirated engine improvements for the 4.6 2V. The Mamba package added a Vortech blower and additional suspension improvements to the Mustang package. The Cobra leveraged the 4V platform as its canvas for Steeda’s best performing vehicle in 1998. 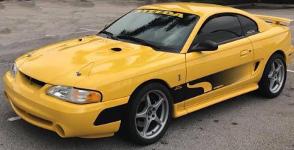 Check out this cool 1998 Cobra Steeda Mustang in Chrome Yellow exterior paint (officially Steeda 98-011). This amazing car is owned by Jose Valverde and he photographed it with a Hot Wheels package making it look like a small special toy model. This photo is our Attitude Of The Week starting January 12, 2019. Jose also sends us images of the 1998 Steeda Mustang sales card. This is a copy of the 1998 Steeda Mustang sales brochure. Models include additions to the 1998 GT and Cobra Mustang. The cover shows a Rio Red Steeda GT Mustang. A new GT package for 1998 was the Mamba Steeda which included a 340hp supercharger. The standard 1998 GT V8 had 225hp.